The Great Pacific garbage patch—a swirling sea of plastic bags, bottles, and other debris—is one of the biggest environmental problems that little people know about. The poster “Use Recycle Bag” contributes to the three goals of “The Universal Sea: Pure or Plastic?!”. It was recently created to fight plastic waste in the seas and promote awareness of this severe anthropogenic problem. 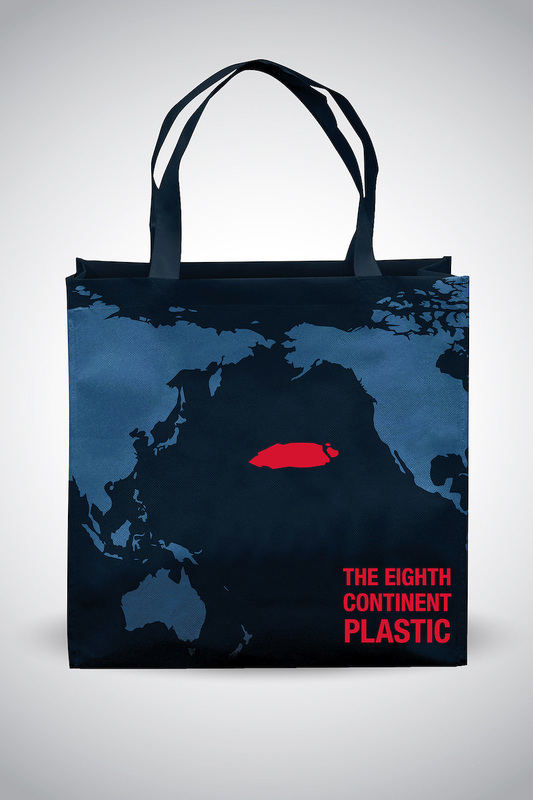 In this poster, the front design of a dark blue recycles bag consists of a map of the world and a new continent—the eighth continent made of floating plastic trash. It encourages people to use recyclable products to reduce plastic waste. The role of artists and thinkers in our society is to share knowledge and ideas and inspire others to solve ethical, social, and environmental issues. This is one of the three goals of “The Universe Sea.” The designer of this poster hopes that her work would assist the public audience, scientists, entrepreneurs, and culture producers to find creative solutions and actions against water pollution. Water is the source of life. The purpose of this poster is to protect water, in the end, to protect life. Ms. Zhou will be glad to offer three types of workshops/actions. 1) Environmental poster lecture and exhibition. This exhibition can be shown in both physical space and online gallery to reach a wider audience. Her lecture and exhibition will focus on the contemporary international environmental poster design, in addition to her creative work. 2) Origami workshop of sea creatures. In this workshop, she will guide people of all ages to create origami ocean creatures. 3) Poster workshop. This workshop would encourage people of all ages to use concise visual languages and imaginations to create meaningful posters on how to solve the issue of water pollution. “Use Recycle Bag” is part of the “Backward Waves” Social and Environmental Poster Series, which Jing Zhou began to create in 2007. [ HERE] Inspired by many internationally acclaimed designers, such as Gunter Rambow, Lanny Sommese, and Luba Lukova, this body of poster design is a manifestation of current social and environmental crisis on a global scale, which includes war and peace, human rights, gender issues, AIDS, climate change, environmental problems, and more. The theme of this series addresses contemporary problematic realities and impacts on the future of the world. Creating this poster series not only encourages Ms. Zhou to observe life against a larger background and gain empathy for the unfortunate but also gives her the firsthand experience of being a conceptual designer for social change. The title of this project “Backward Waves” is based on John L. Castri’s saying, “Reality is a wave function travelling both backward and forward in time.” These posters have been exhibited and published in Europe, the U.S., Brazil, and Australia by international organizations and galleries, such as International Federation of University Women (GWI) in Geneva, Greenpeace USA, Amnesty International, World AIDS Campaign, Danish Poster Museum in Denmark, Mons Memorial Museum in Belgium, and Triennale Design Museum in Milan, Italy.